Said Dov Baer, the Maggid of Mezhirech: Your kind deeds are used by God as seed for the planting of trees in the Garden of Eden; thus, each of you creates your own Paradise. 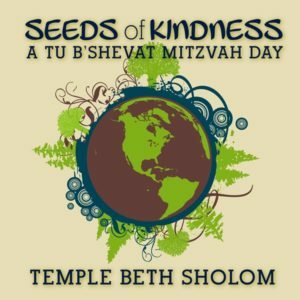 This year TBS is doing Mitzvah Day with a twist—an environmental focus. Our projects and programs are all focused on tending to and celebrating the earth. With this in mind, you will notice that many of our programs and projects are being held at the temple this year. Join us for a day of fun, friendship, and meaning for all ages.